Cicadas zither noisily in the midday sun. The heat is all-enveloping and brings out the scent of oregano and basil, whilst in the distance the tap-tapping of a lone archaeologist travels across seemingly endless columns, archways and fallen statues. 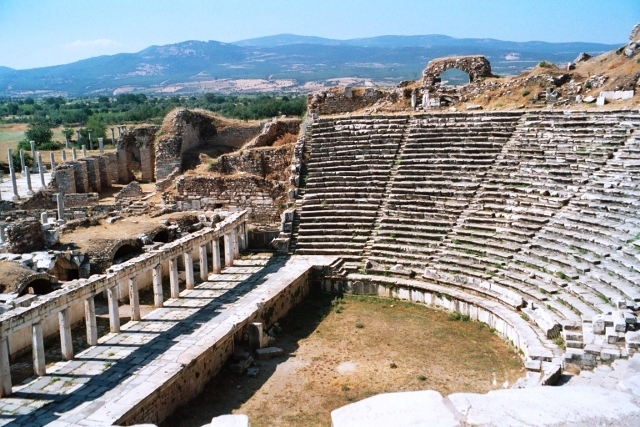 Sitting half way up the cool marble seats of the Theatre at Aphrodisias, Turkey, you are transported to another world; a world without the immediate gratification of internet access, mobile phone messages, plane travel and fast food. Over 2000 years ago the locals decided to add an entertainment centre to this temple complex. The area had been associated with fertility cults since the Bronze Age, with the Greeks dedicating it to their Goddess of Love; a temple to Aphrodite was built in the 8th century BC. Later on the Romans transformed the site into a cultural centre and the Theatre became a focal point for a wide variety of entertainment. These included ever-popular gladiatorial combat, wrestling bouts, boxing and animal baiting, as well as more traditional theatre. Nearby is the Stadium where athletic youths races against each other and threw javelins far into the distance. In Hadrian’s Baths mosaic tiles recapture the art of a long-gone craftsman and the massive columns of the roofless Temple of Aphrodite give a vague idea of just how significant Aphrodisias once was. Escape from the heat to the Aphrodisias Museum, showcasing a superb collection of sculptures and beautiful objects found on this site only a short distance from the west coast of Turkey and the shores on the northern Aegean. I can highly recommend exploring other ancient sites in Turkey, including world-famous (and very crowded but oh-so-worth-the-hassle) Ephesus and much quieter Miletus. This entry was posted in Culture, Photography and tagged amphitheatre, aphrodisias, greek, roman, ruins, temple, turkey, turkish. Bookmark the permalink. Fascinating to read about Turkey! Thanks Sandra – it’s a lovely country.